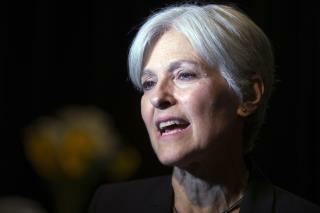 (Newser) – A Green Party-backed campaign changed its strategy to force a statewide recount of Pennsylvania's Nov. 8 presidential election, won by Donald Trump, and said late Saturday that it will seek an emergency federal court order on Monday for a recount, hours after abandoning an effort in the state courts, reports the AP. "Make no mistake—the Stein campaign will continue to fight for a statewide recount in Pennsylvania," recount campaign lawyer Jonathan Abady said in a statement, via the Philly Voice. "We are committed to this fight to protect the civil and voting rights of all Americans." Abady said barriers to a recount in Pennsylvania are pervasive and the state court system is ill-equipped to address the problem. Saturday's court filing to withdraw the case said the Green Party-backed voters who filed it "are regular citizens of ordinary means" and cannot afford the $1 million bond ordered by the court by 5pm Monday. This two-bit Jill Stein gal is really annoying and wasting everyone's time / money. Pfffft~~' as if she any chance to win ANY state in the 1st place. I think she's just HRC's latest scapegoat. Like Donna Brazile, Debbie Wasserman & Huma Aberdin. . . . what absurd cast of characters ehh? ?